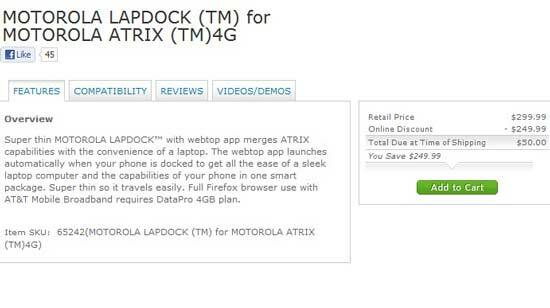 AT&T offers Motorola Lapdock for the Motorola ATRIX 4G for $50 only! There is no confusion that Motorola Lapdock is a nice and innovative accessories for your mobile phone. By using it with your Motorola Atrix 4G phone, you can transform a smartphone into a notebook with an 11.6-inch screen is a very desirable feature. But when AT&T released it for the first time the price was the point everybody pointing. You have to pay extra $500 after buying Atrix 4G for $300 on contract. Well, there is great news for those of you who have an ATRIX 4G or someone on your holiday shopping list who does. AT&T has the Motorola Lapdock for the Motorola ATRIX 4G for $299.99 with a $249.99 instant rebate and free 2-day shipping. It means a whole zero has been shaved off of the Lapdock's price tag making your cost a mere $50 plus tax. One online sales representative confirmed that anyone could take advantage of this deal. It does not have to be purchased with a Motorola ATRIX 4G or even by an AT&T customer. Its a fabulous deal for Christmas. I think AT&T's trying to clear out remaining stock prior to giving the dock a proper retirement. Check out AT&T website now to see the Lapdock price yourself and place your order. You need it with your Motorola Atrix 4G, i bet!